Image: © Mariette Pathy Allen, A novice nat kadaw preparing to assist their teacher at a nat paw in Mandalay. Ancient swords are part of the ritual stories of the nats. Join us at ClampArt on Thursday, 12.14.2017, from 6.00 – 8.00 p.m., for a pop-up exhibition and book release event celebrating Mariette Pathy Allen’s new monograph Transcendents: Spirit Mediums in Burma and Thailand. Signed copies of the book and the latest issue of Aperture magazine, “Future Gender” (guest edited by Zachary Drucker and including work by Mariette Pathy Allen), will be available for purchase. 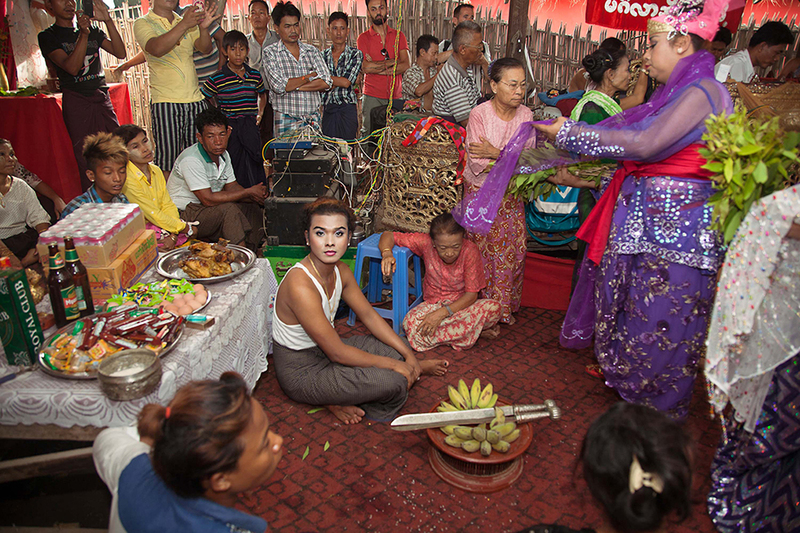 In collaboration with Dr. Eli Coleman, professor and director of the Program in Human Sexuality at the University of Minnesota, “Transcendents” studies the phenomenon of gender variance among the spirit cults of Burma and Thailand. This book combines a raw, personal, photographic standpoint with an anthropological and sexological perspective on the gender fluid spirit mediums in Thailand and Burma. Mariette Pathy Allen has been a pioneering force in gender consciousness, contributing to numerous cultural and academic publications about gender variance and lecturing worldwide. A published author and photographer, her other titles include: “Transformations: Crossdressers and Those Who Love Them” (1990), “The Gender Frontier” (2003), and “Transcuba” (2014). Dr. Eli Coleman is a founding editor of the “International Journal of Transgenderism” and past president of the World Professional Association for Transgender Health. Zackary Drucker is an award-winning cultural producer and trans woman who breaks down the way we think about gender.